I made these cookies well before the holiday rush way back in early December. I had a friend coming over for dinner and wanted something special for dessert. I had spotted these “no-reos” a few days earlier on a new-to-me blog called The Gluttonous Vegan Loves You (the name is as adorable as the blog itself) and I knew that this was the cookie I was going to try. I’m not really a fan of iced cookies, but I knew that my friend would love them, so I whipped up a batch. 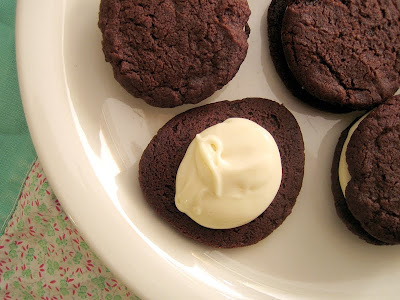 Despite the added component of making frosting, these are quite simple to make. And, the cookies taste amazing….even without the frosting! 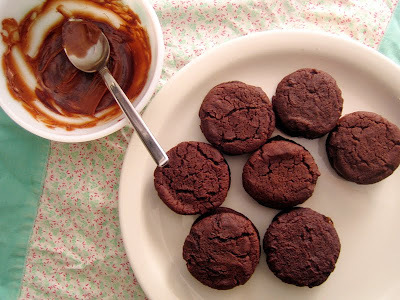 I think these cookies, plain, will be made again and again when I’m craving something sweet. While the original recipes is fully vegan, I made my frosting totally non-vegan since I didn’t have any vegan cream cheeze on hand. But do what you like, vegan, vegan-ish, or made with butter and dairy, these are fine, fine cookies. But do they taste like the real thing? They really do! 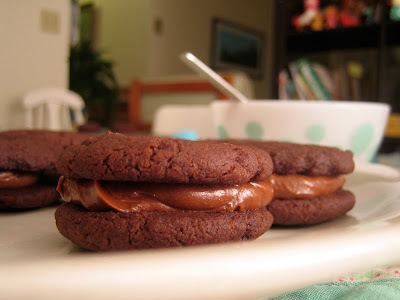 The chocolate cookie is nice and dark and not too sweet and together with the vanilla filling, it’s the ultimate sandwich cookie. I decided to make a chocolate version to go along with the vanilla, and the chocolate filling turned out better in terms of texture which I’m guessing is because the extra cocoa made it extra sturdy. The vanilla tasted more like an Oreo, but because I was hesitant to add too much icing sugar, it was soft which made the cookies smoosh around after each bite. Which isn’t too much of a problem, you know? Before I solicit any Portland, OR travel tips, I have some exciting blog news! You can find out more here on EverybodyLikesSandwiches.com (hint, hint!). Stay tuned for more details once things get wrapped up on the switch. Now, about Portland…we’re heading down for a few days via train which excites me to no end. We’re staying downtown at The Nines (got a super-dooper deal) and will be using our feets and public transit to get around. I’ve waxed about Portland so often, and we definitely have our favorite spots (Pine State Biscuits, Pambiche, Amnesia Brewing, Reading Frenzy, Powell’s, The Tin Shed, Hedge House), but again, would love your help in discovering a few more. Food cart recommendations, cozy pubs & drinking spots, great little indie shops, etc. Leave a comment & I’ll see you next week! 1. Preheat oven to 350F. In a large bowl, mix together the first 6 ingredients (flour through sugar). Pour in the melted margarine and canola oil and mix it well. Stir in the milk. The mixture will be a bit crumbly, but that’s just how it is. Go with it. 2. Use a teaspoon to ball up the dough, roll it into a ball and then slightly flatten it down with your palm. These spread quite a bit, so keep the cookies spread apart on your cookie sheet. Bake for 8 minutes or until the tops crack slightly, while remaining soft. Remove from oven and let sit on the cookie sheet for a few minutes before transferring to a cooling rack. Makes about 30 cookies. 3. In a medium sized bowl, combine the cream cheese with the icing sugar, salt and vanilla until the icing is smooth and of a good consistency. If it’s too thick, thin it slightly with a tiny bit of milk. If it’s too thin, add in more icing sugar. Divide half of the filling and add in the cocoa if you want to make 2 fillings, one chocolate. 4. When the cookies are thoroughly cool, pair up the cookies of equal sizes and spread one half with a dab of the filling. Press the cookies together so that the filling spreads out. Now, try not to eat them all at once. Mmm, yum! I'm totally making these! Ha, I think I say that everytime I comment here. Have lots of fun in Portland (jealous), and congrats on the new site! I'm definitely going to try these! Can't wait 🙂 Looking forward to the new site! Hope the transition was smooth. I live in the old p-town and let me tell you the food carts on SW 10th and 11th on Washington St are super tasty. They are about 7 blocks West of the Nines. Also in the SE there is an amazing spot called Pok Pok, it is thai food but the best kind there is. All fresh ingredients with some of the most spectacular spice parings you will find. If you venture over to NE Mississippi there is a really cool food and gift shop called the Meadow along with several shops that sell hand printed cards and stuff. That is one of my favorite areas to spend a day in and don't forget to stop by the old Portland Coffee staple; Stumptown for not only one tasty espresso but some good people/hipster watching just the same. Have fun!! Wow these cookies sound and look awesome. I love oreos and these oreo-ish cookies look like they would satisfy that craving. Congrats on the new site and have TONS of fun in portland!! Hey, there's a great bar on 50th and Hawthorne Blvd in SE called Sapphire Hotel. It was a brothel way back when and now it's a dark, intimate, snazzy bar with delicious marrionberry margaritas. Genies Cafe is on 11th and Division in SE and is great for breakfast but expect to wait. My other favorite restaurant is called Biwa. It's Japanese/Korean and it's a nice little hidden place in a basement (the ambiance is better than it sounds, I promise). Really good grilled skewers and noodles. It's on SE Ash and 9th and you can get there super easy from The Nines by taking bus 12, 19 or 20 and getting off in front of Jupiter Hotel on Burnside then walking a couple blocks to Ash St. Hope you have a fabulous trip! I moved away from Portland a few months ago and I'm super homesick! mmmmm an oreo that isn't totally full of chemicals, count me in!! Congrats on the new site – so exciting! Have a great time in Portland. amazing. these are vegan? wow girl you have some amazing talent. can't wait to see the new website. I have to get a dot com and soon. Congratulations on the site move! That is something that has been on my to do list for years now. I can't wait to see your result! Have fun in Portland. I used to live out that way and I miss it quite a bit. Oh have fun in Portland, I love it there! Looks like you got all the good places to eat down, but you must check out Powells book store…amazing!!! I recently made red velvet cookie sandwiches.. although they are not vegan.. I can easily see it being vegan.. I second the person above who mentioned Pok Pok, although the owners just opened a new more casual small-plates and yummy cocktail place right across the street! It's called Whiskey Soda Lounge, and everything I've tried there is to die for. It would be a great option if you're not up for a big restaurant night, but still want to eat amazing food in a great atmosphere. If you're looking for a neat bar to try before or after a dinner, I would highly recommend Ron Tom's on E Burnside and 12th-ish. Big fire place, neat warehouse-y vibe with really good drinks. It's funny I was just thinking about Portland and doing the exact same thing… (taking the train down) Are you going with our in-common friends? It will be good to hear your latest from Portland. Congrats on your own domain! You are master of your (own) domain! Well, having just returned last night from a weekend in Portland I can tell you our favorites! We ate at Native Bowl, a vegan food cart at the new Mississippi Marketplace which was outstanding (both the Mississippi Bowl and the Gravy Bowl were great). There are quite a few carts here and the neighborhood is super cute and there's a German pub next door. There's also a food cart called the Sugar Cube, which was closed when we were there but looks fantastic. We stopped by Potato Champion for Belgian frites at about midnight on Saturday and it was also wonderful (and very busy). They're at the corner of 12th and Hawthorne with quite a few other food carts. I'm assuming you know about the food cart site (http://www.foodcartsportland.com/) which is a great guide. We rented Dutch bikes at Clever cycles on Hawthorne ($20 for 4 hours) and cruised all over the city Sunday afternoon. Highly recommended and Clever Cycles is just worth checking out anyways if you're into bicycles (which I know you are). Have fun! And congrats on the new site! I can't wait to see it. Congrats on the new site, exciting! And those cookies look great! Laurenhurst Market – http://www.laurelhurstmarket.com/ Same owners as Simpatica, another winner. por que no – http://www.porquenotacos.com/ A few locations, so delicious! Bakery Bar – http://www.bakerybar.com/ The NE Glisan location has breakfast, both locations have great coffee and amazing pastries. We always stay at the Kennedy School http://www.kennedyschool.com/, and if you've never been it's worth a trip. A few bars (honor bar and detention bar), a movie theater where you can buy pizza and beer, a really homey restaurant, McMenamins does it right! Boy, I could use a Pine State biscuit right about now! Good thing I'll be in Portland for a wedding this July. Congrats on the new website! Your little toast-man is too cute! I am so excited about your big change! Even the placeholder at your dot com looks great (was there ever any doubt) so I can't wait to see what you guys have in store! oh and these cookies look so so good. These look great. Oozy icing? I'm all over it. Hope you have a grand time in Portland. Powell's is my very favorite hangout there. You have to have a pneumatic drill to get me out of there. Can't wait to hear about your trip! Portland is my adopted hometown, and I'm sad to say I get back there only too rarely. However, when I do, one of my favorite treats is the burger at Higgins (corner of Broadway & Jefferson). You have to read the menu carefully to 'decipher' that there IS a buger on the menu, but believe me, it's TOTALLY worth it! It is, beyond a doubt, my favorite burger west of the Rockies. Up front, the place is a bit chi-chi for me, I prefer the old-school bar in the back room where you can belly up to the bar & order a Guinness to compliment that fan-damn-tastic burger. Those homemade oreo's are adorable! I've never made sandwich cookies before. I'll have to return to this recipe maybe next month after I have dropped a few pounds from all the Xmas baking and sampling this past month. Thanks for the well wishes, Becka! Naomi, thanks for posting such a great recipe! Yum. Mel, the transition won't happen for another couple of weeks, but I just had to share. I'm horrible with secrets. Cary, thanks for your awesome suggestions! Yay, love the tips Kris. Marking. I know, it's better than an oreo, StephChows! Dawn, I'm pretty excited about it. I've had the domain for years but have been too busy to work on it. Daily Spud, I'm the same about sandwich cookies, but when you make them for someone else, it's easy! And worth it because I'm totally making the cookies again. Monday, I'll def spend a ton of time in Powells. Emily, thanks for the recs! I can't wait for our trip. never heard of it, Sarah, I'll totally check it out. I love the Mississippi area. Yay, Arajane, thanks for the suggestions. Heard about the pub & will so check out the food cart too. Yum. Haha, Shannalee! Thanks so much. Lynn, I love Powells but my husband will be there for days! Anon, I'm always on the lookout for a good burger! Ha, you are sneaky but wrong! I only started working on it recently with a shut mouth. All my coding has been for clients. This week it's been for me. love portland! have so much fun there! i'll have to ask my other half if he remembers the amazing restaurant we went to, as my head is in a cloud today. so excited to see the new 'home'. happy new year!!! xo. yum, homemade oreos! Just what I needed…the one place I would recommend in Portland is a darling little bakery/coffee roaster called Blue Gardenia. (I have to confess a dear friend of mine owns it but even if she didn't I would still think it was AWESOME!) It is on N. Mississippi, which is a super great place to stroll and check out in general. very jealous, I used to live in Portland and miss it terribly! 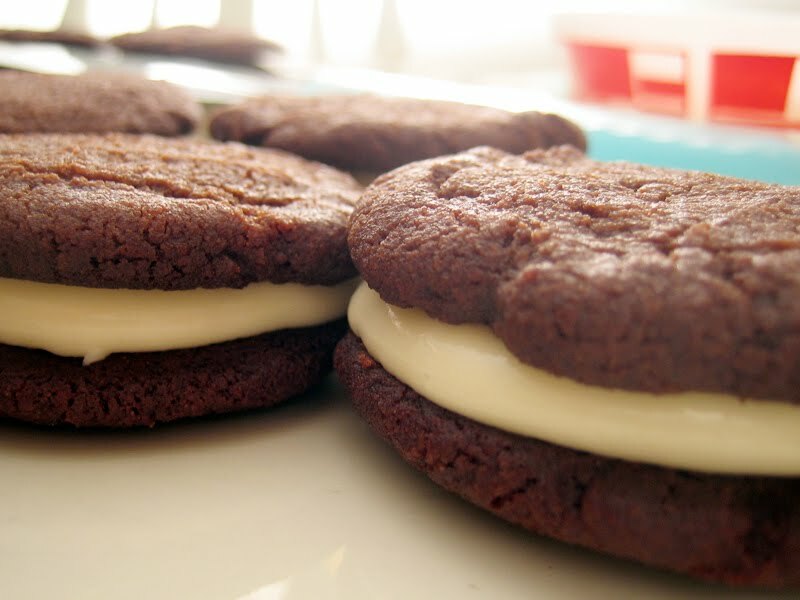 Whoopie pies! I've got a couple of your recipes saved in my bookmarks. This looks like a great summer treat. Can't wait to follow you over to the new domain. You've gotten so many great Portland recommendations, it's probably pointless to add any others! Biwa, Sapphire Hotel, and Autentica are probably my faves out of many things listed. Oh, did anyone mention Podnah's Pit BBQ yet? They actually having an amazing breakfast and I personally like their biscuits better than Pine State Biscuits, FWIW. I bet you would totally love The Meadow on Mississippi for tasting/buying fancy salts and chocolates. I would steer you clear of Helsers though. I think their breakfast is okay but pretty standard. Have a great time in Portland. Wish I was going! The Doug Fir is fun for any meal and is ridiculously cheap during happy hour. They also have some good music in the evenings. Veritable Quandry is good for a higher-end meal (or have brunch which is more affordable). And don't forget to sample some food carts. Yum, those cookies look great! My favorite snack cart is on SE 12th and Hawthorne, Potato Champion. There's a really great crepe cart next to it as well. If you haven't already checked it out, this website lists all the food carts around town: http://www.foodcartsportland.com Hope you have a fantastic visit! Last time I visited Portland was a while ago but we ate at this wonderful place called Lucy's Table. It's still there and still getting good reviews. Have a great time! Hey exciting – re the dot com. We are doing the same thing! moving from blogger to wordpress with a dot com! Having fun yet? And have a great trip. I'm sooooooooo jealous! I lived in Portland for four years, and recently moved to Bamako, Mali…so I dream of my lovely cafes, bars and restaurants regularly. Many of my favorites are already on your list or on those above (Pok Pok and Sapphire are fantastic), but I must also share my favorite haunts. Happy hour: Gold Dust Meridian on SE 33rd and Hawthorne. 2-8pm, luxe grilled cheese with soup and salad for $6! Breakfast: Right down the street (SE 35th and Hawthorne) is Bread and Ink cafe, which has an amazing WALK-UP WAFFLE WINDOW with delicious (seasonal) waffle concoctions and a cute sidewalk cafe. Southern Comfort Toss-up: Screen Door on SE 22nd? and Burnside, serving amazing southern food with a Pacific Northwest twist..they have a seasonal organic veggie sides menu that you can turn into a meal (3 for $12). Country Cat at SE has fewer veggie options but the food is incredibly tasty and perfect for a rainy winter night; less accessible by public transport. Prix fixe: Tabla on NE 28th (near Burnside) has a fantastic $24 three course mediterranean/italian menu . Tapas: Toro Bravo NE Russell off of MLK Blvd. Be prepared for a wait, but really, GO. Please have a lovely time — I'll be living vicariously through you! In Portland: Mother's for dinner; the Waffle Window (it may not exactly be called that, but that's what it is) attached to Bread and Ink for a snack. Have fun! Lovely cookies! Have a wonderful time on your trip, and I'll look forward to checking out the new site! my spatula, thanks so much! I think portland must be full of amazing restaurants, as I've never been disappointed. sam, nope, oreos not whoopie pies! Yay, more recs, thanks so much T&R;! Nancy, food carts are a must, and I've been to the Doug Fir for happy hour once. Maybe there will be a good show while we're there. I know where those carts are! I really want to try Potato Champion! Haha Jan! It's been a good learning process! Luckily, the husband is doing all the hard work. Violet, a waffle window sounds like heaven. Alex, thank you for your thoughts! Everything sounds delicious and I wish I was there for more than just a few days. Swengie.G, thanks for the Screen Door tip, I've always gone by it but maybe this trip we'll actually visit! Por Que No Tacos in PDX. It is raining cats and dogs now, but they say that by Thursday we´ll see the sun!!!! Enjoy! I love this city! Anon, I love your direct to the point comment. Maija, thanks for your rundown. I love that they're close to our hotel! *Sawasdee Thai – one of my fave Thai places – love their pumpkin curry. Not sure what days you are coming, but just be aware that many carts are only open M-F during lunch hours for the business crowd. Check foodcartsportland.com for a best guess for hours if there's one you really want to try. Happy New Year — and good luck with the blog transition. Looks like your new home is gonna be fab! Oh, I looove Pampiches! I just got back from Portland for my first time, and discovered that little gem while I was there. My other favorite things to eat were found at the Pearl Bakery, everything there was absolutely charmingly delicious. I strongly recommend.. I actually just posted pictures from my trip on my blog! And was waxing lyrical about my love for that city. The picture with the painted waiter is from the Pied Cow, by the by. Toro Bravo is also consistently amazing, and Por Que No? makes my favorite taco in town. These cookies look delicious. I'm thinking of a friend I need to forward this to. And congratulations on your upcoming new blog format! Of course I will be following you there. Pok Pok is great! The fish sauce wings there are possibly the most flavorful things that I have ever eaten. Plus it is close to Pix Patisserie for delicious dessert pastries. The Waffle Window is great for a cheap breakfast but it may be too cold right now to properly the outdoor seating. Andina (someone else mentioned this one) is pricey but has a decent happy hour. Have a super time!! I live in Seattle but make sure to eat there every time I make it to Portland, like this weekend! Their buttermilk shakes blow my mind! These look very delicious. I am going to make these. However, I have a question, what is vegan butter made of. I ask because I no longer eat regular butter so I am looking for a healthy alternative. Martha, next time for sure. I love pine state but I like your other recs. Marking! Thanks leftoverist. The cookies are amazing, so I'm sure your friend will love them. eviedee, pok pok was closed while we were there. Next time for sure! kat, I was there a year ago. Cute cafe for sure! Great breakfast sandwiches too! MissAlyssa, hope you enjoy them. Dee, vegan butter is dairy free. I use http://www.smartbalance.com/ and you can check the site for more details.